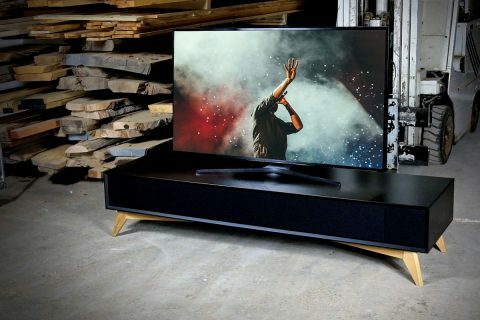 It happens, and not too rarely I would say, that people buy loudspeakers that initially sound good and please their eye, but when in their final position in the living/listening room, turn out to be sonically closer to the average than expected and not necessarily even look as elegant as in the shop. The next obvious step is to find some solutions for the room, both in terms of interior design and room acoustics. That’s one way to do it. Another is to start from the room, make it look appealing while ensuring decent acoustics. For example, it might be a wise strategy first, with the help of suitable acoustic panels, try to make human speech (voice) sound about right, not too lively, not too dampened but natural, in the space reserved for music listening. If one succeeds with this goal, there’s a high probability that music (vocals and instruments) too would come out pretty correctly in the same space. Design company Woodnotes, famous for its paper yarn carpets and design furniture, is very much in favor of the second approach. 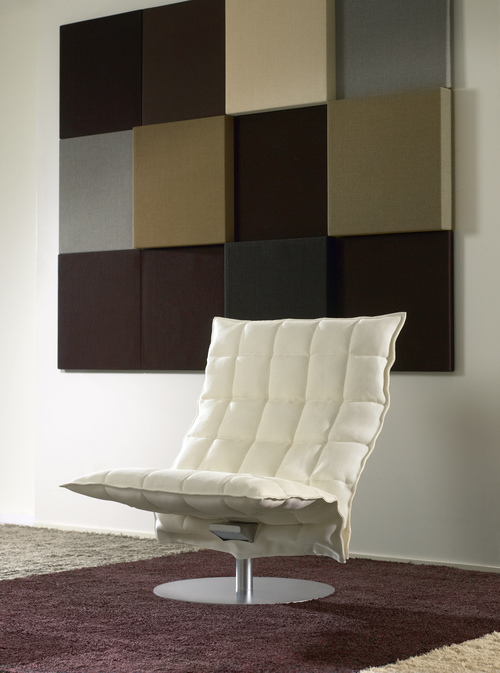 It offers aesthetically appealing acoustic panels with which the workspace and/or the living room can be made both impressive-looking and sonically pleasing. But that’s not all. 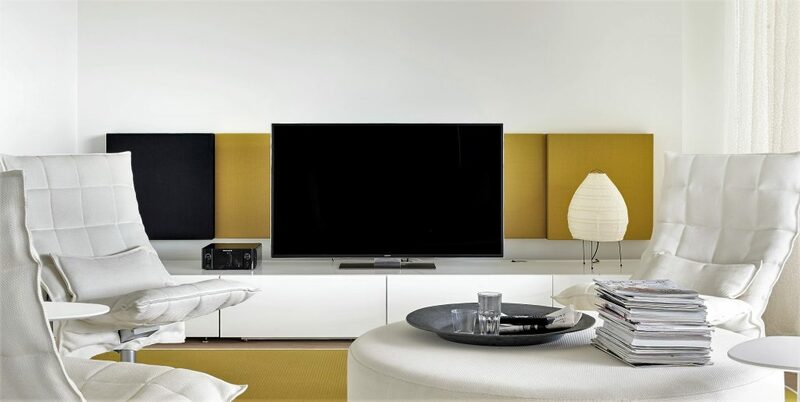 It also manufactures flat panel-like loudspeaker called Loudwhisper, and guess what: those loudspeakers can be perfectly integrated – camouflaged – into the entire set of acoustic panels so that they completely and literally disappear visually. Of course, when we’re talking about people who, as a matter of priciple, don’t get excited about filling their living room with massive speaker cabinets or who do not find cable clusters on the floor in any way attractive, acousticating the living room – acquiring broadband absorption panels for the strategic spots on the wall and ceiling, a couple of the diffusers here and there, and so on – inroduces itself as a flavorless technical project. On the other hand, the situation in this regard is not that appalling any more. Numerous are the companies nowadays that offer a wide variety of acoustic panels that do not look like acoustic panels, but rather resemble an art work, and allow customers using them in a creative way in the interior design. The contribution of Woodnotes to this trend is environment friendly and sound absorbing Whisper-panels designed in cooperation with Tapio Anttila. Panels are made by Ewona out of recycled, heat-bound polyester fiber. The material is non-allergic and meet the M1 emission standard plus perfectly dust and moisture free. The frame is made of veneer. Each panel, including its sides, is upholstered by hand. The fabric is so stiff that it requires a qualified upholsterer to do the job: for an internationally acclaimed design company it is prerequisite that, in addition to other tiny but important details, the upholstery is bullet straight. Hanging the panels up on the wall is child’s play with the supplied support rails. 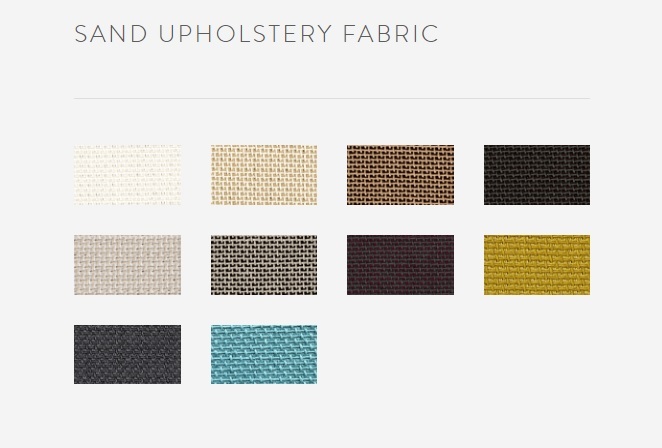 The fabric used as a surface material is woven from Woodnotes’ trademark: paper yarn. It is spun from very long fiber and wet wrapping paper grades. 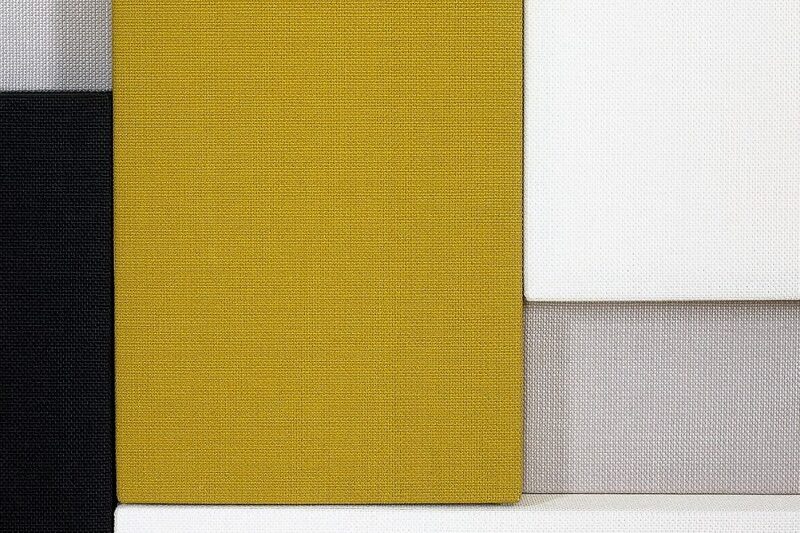 The fabric that covers both the Whispers acoustic panels and Loudwhisper speakers is called Sand. It’s 70% paper yarn and 30% cotton (660g/m2). 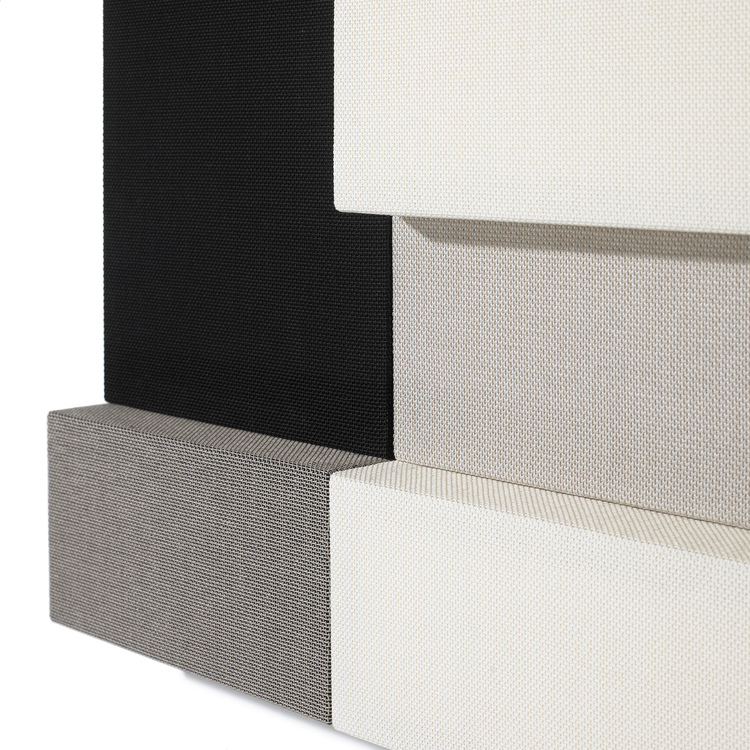 The fabric is an absolutely essential part of both the acoustic panel and the loudspeaker as a product. In the absence of other outer marks, it is what gives them their prime character. It is a factor that combines Woodnotes products and enables searching for a uniform aesthetic line for the interior design. 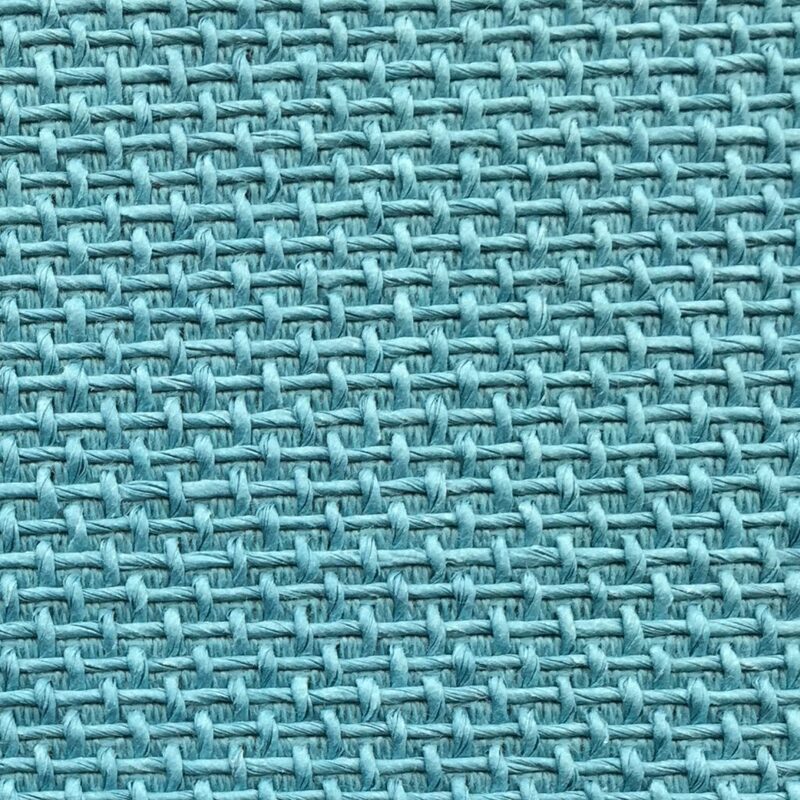 The hand-woven surface of the fabric does not look dead or industrial. 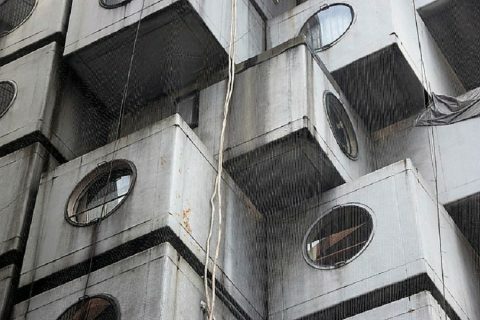 Its texture evokes a variety of sympathetic connotations. It has the idiosyncratic naturalness and simple harmony of its own. It possesses everyday beauty and is a perfect exemplification of the concept of ”Scandinavian design”. The selection of colors is anything but blatant. The colors do not jump in the face. 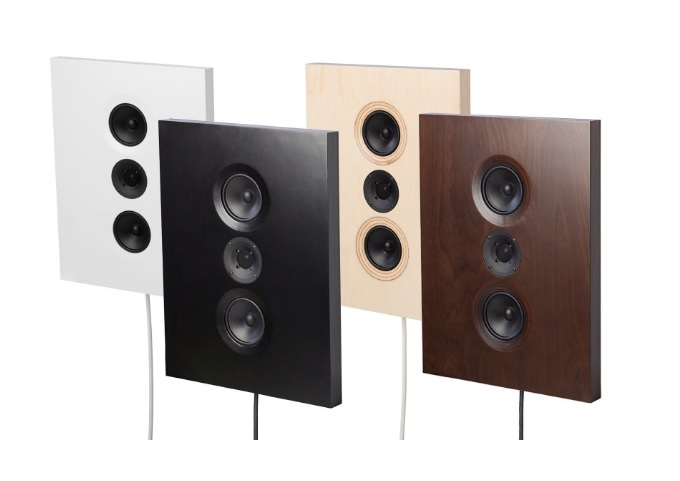 If you’re after a circus-like interior, the Woodnotes panels/loudspeaker probably aren’t for you. The premise is very often white, black or grey: stone grey, graphite grey, black in various shades, natural paper brown and so forth. And in between a little mustard yellow or smoke blue. One great advantage of the Woodnotes panels is that they are like created for building up architectural visual wholes, whose expression can be individually modified by mixing the colors and the sizes (60×60, 60x80cm), as well as the direction. The resulting wholes, the reliefs if you like, can be geometrically grouped and arranged, or asymmetrically, or they can be made to form horizontal chains etc. The principal thing is to try to maintain a certain rhythm ja solid configuration. In view of combining several panels into one bigger whole, it’s fundamental that the panels are available in two thicknesses. 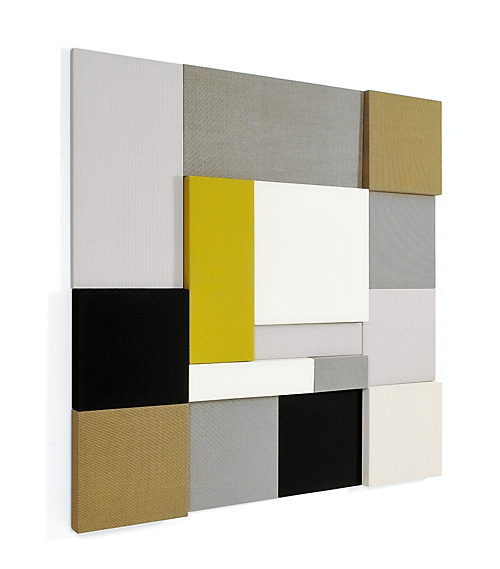 Mixing thicker and thinner panels interlocked adds livelihood, movement, and 3-dimensionality. The differences in depth and the ensuing light/shadows transform the panel wholes into sculptures. The Loudwhisper loudspeaker is almost impossible to tell apart from the Whisper acoustic panel by sight only: the same shape, the same stylish paper yarn fabric, the same broken/busted color world. White and black are missing because in those colors the fabric would have been too dense in order not to filter the highest frequencies. Beneath the Woodnotes fabric hides a genuine wall loudspeaker. The cabinet is made of 12mm birch ply. 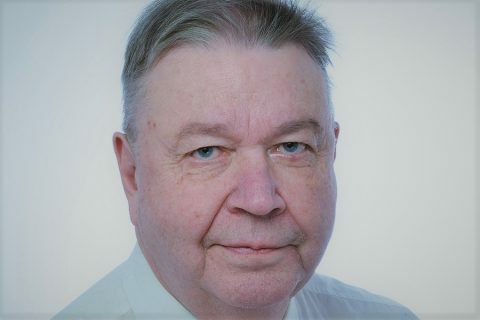 The technical design is Sonolux’s Mikko Sundman’s. 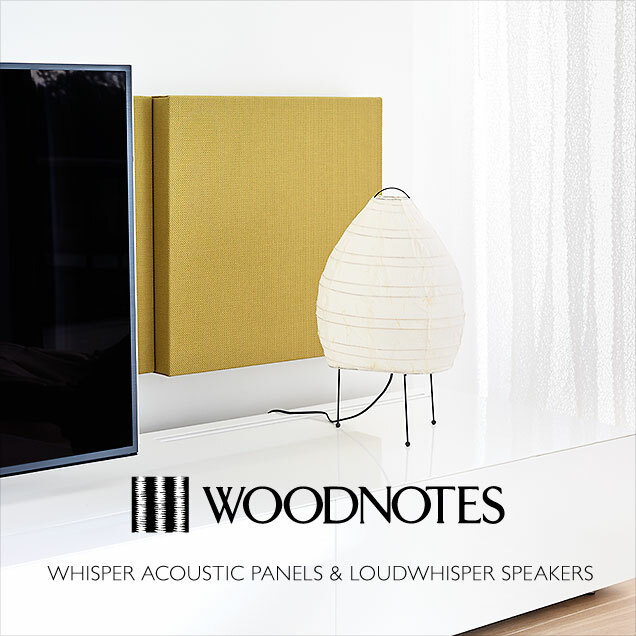 Woodnotes Loudwhisper loudspeaker is based on Sonolux Bebop loudspeaker. 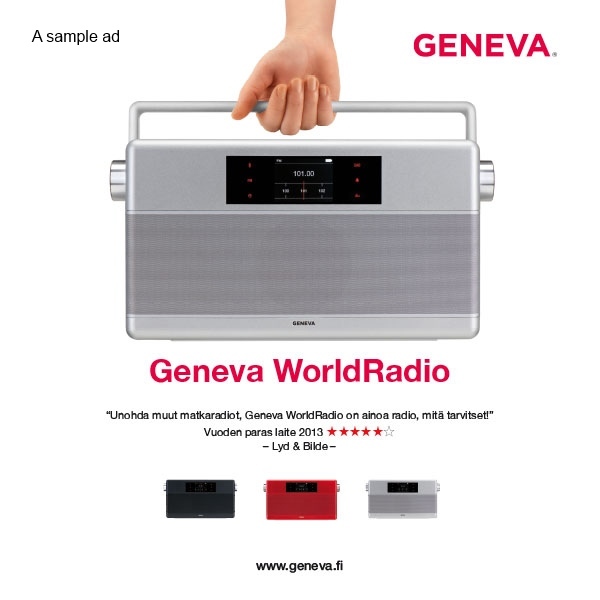 The smaller Loudwhisper measures 60x60cm, the grander 60x80cm, both being 10cm deep. Both are 2-way designs featuring ScanSpeak 6,5 inch mid-woofer with a glassfiber cone plus a short waveguide loaded textile dome made by Seas. The drivers are crossed at 2700Hz by 12dB/oct to both directions. 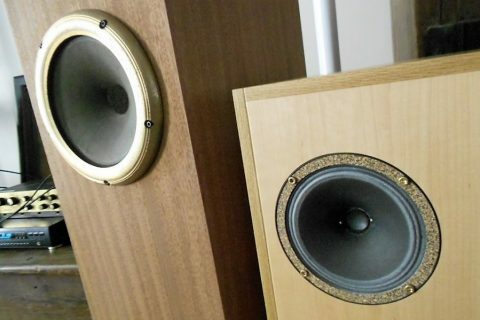 Apart from the cabinet volume, the most significant difference between the two models is the woofer loading: the smaller model sports a sealed cabinet whereas the bigger one is ported. The resonance frequency of the former is said to be 45Hz when the speaker hangs on the wall, and the latter 30Hz, respectively. 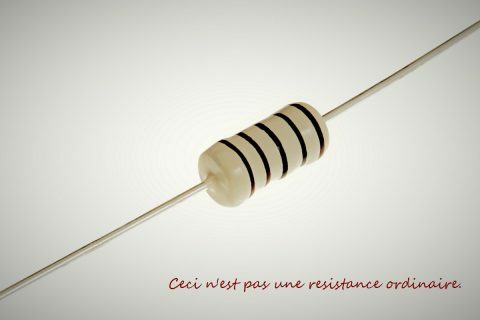 The announced nominal impedance is 8 ohms and sensitivity 85dB. 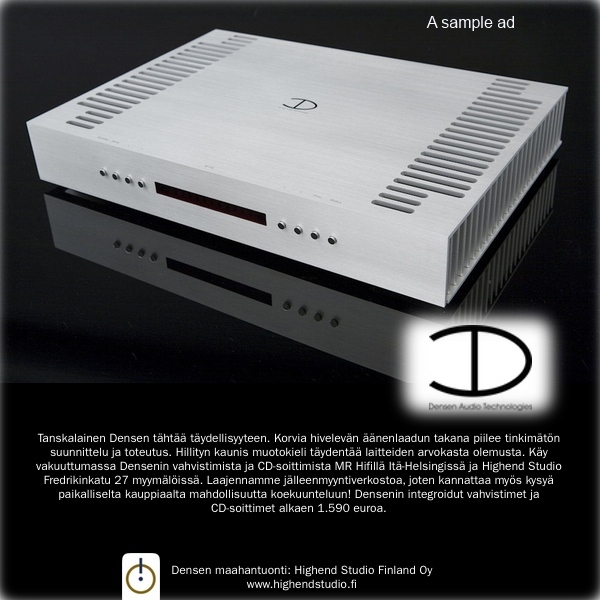 All auditioning took place with a powerful Musical Fidelity transistor amp feeding the speakers, and the CD player from the same brand. 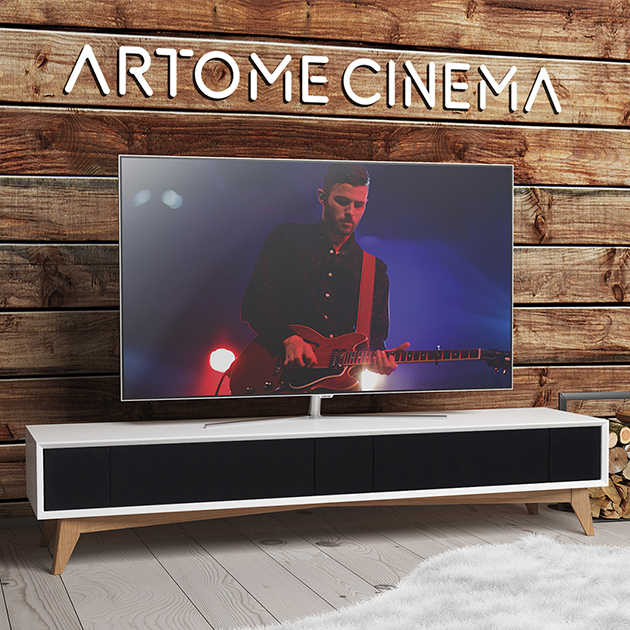 According to the instructions, the smaller speaker must be so hanged that the bottom of the cabinet is 50 to 100cm from the floor, the bigger one in a vertical position 20-80cm and horizontally used 50 to 100cm. 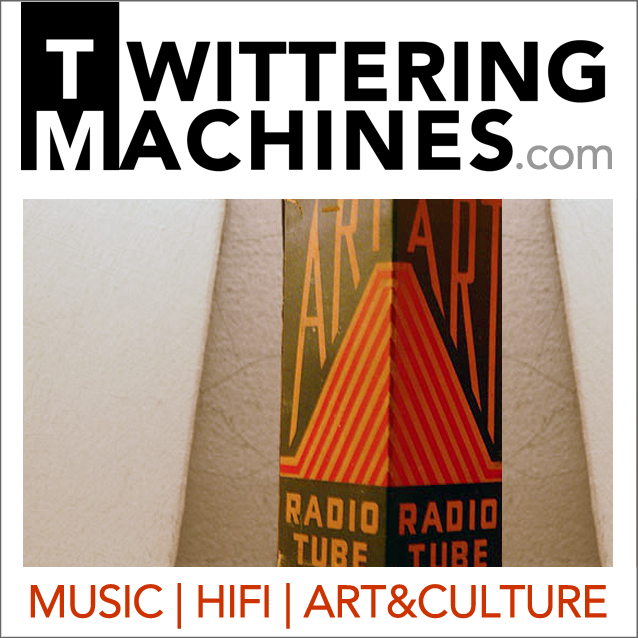 If the speakers are listened to horizontally (the longer side parallel to the floor), they should be placed in a mirror image: the tweeter at the outer edge. The correct direction is marked on the rear panel. 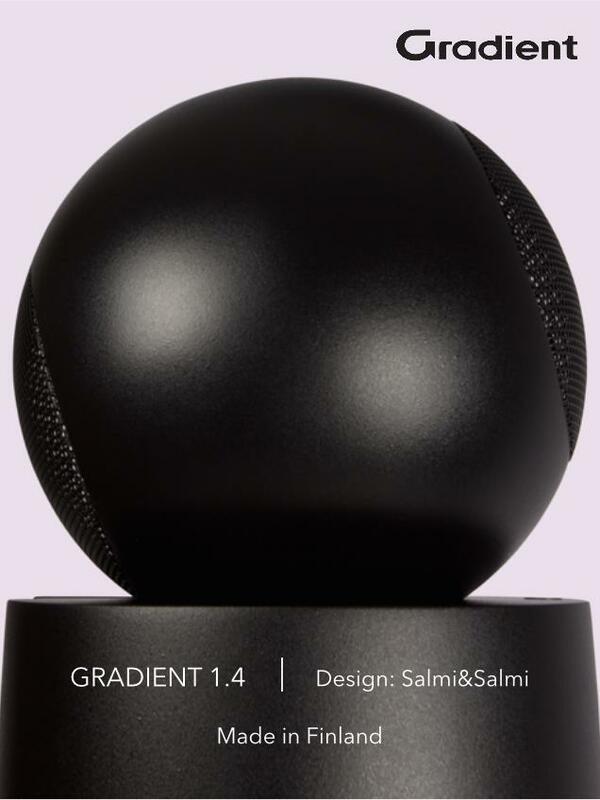 I’ve heard dozens of wall speakers from varying price classes, and although majority of them have outputted a no-nonsense sound overall, very often one can conclude that the tonal balance has been tuned to be commercially pleasing, ie. sonic preference are arranged according to list music. Not so with the Loudwishper. Neither model has unjustified artificial upper bass reinforcement, unless the room or wrong placing on the wall adds it to the sound. 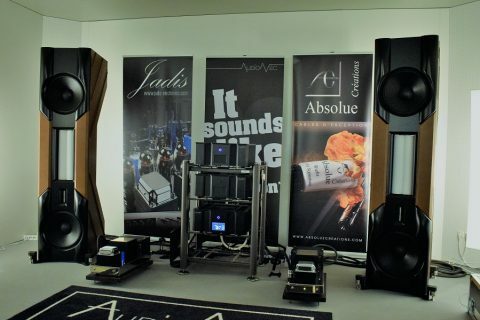 Both speakers sounded mostly transparent, without veiling the details across the spectrum and happily pulling curtains away from the front of the midrange. The achieved tonal balance is smart and healthy. Serious acoustic music sends thanks. As to the bigger Loudwhisper model, music sample after another received well-deserved support in the bass down to mid-bass. The clatter and ruttle of the drum set, with all harmonics to both directions, clacked like in the real life without feeling overwhelming. Even the smaller Loudwhisper was capable of bass performance that is credible, although some bass notes begun to merge when nearing upper and mid bass. The sound of the bigger speaker was more “liberal” in this regard, but also a bit “echoey”. The tone color of neither speaker is cold or rough. Sibylants may be a bit smirking, and it sometimes feels as if in some narrow band there were a little extra hardness, but overall the loudspeakers are capable of reproducing music in a civilized manner even during the most shrilling treble peaks – perhaps slightly too moderately, occasionally. The successful tonal balance and uncolored midrange will serve music on a wide scale, and in particular, I found, vocal music. If one can make one’s wall sound on this level, once can congratulate oneself. In addition, both speakers seemed to withstand high sound pressure levels (SPL) without a risk of fracture or collapse. 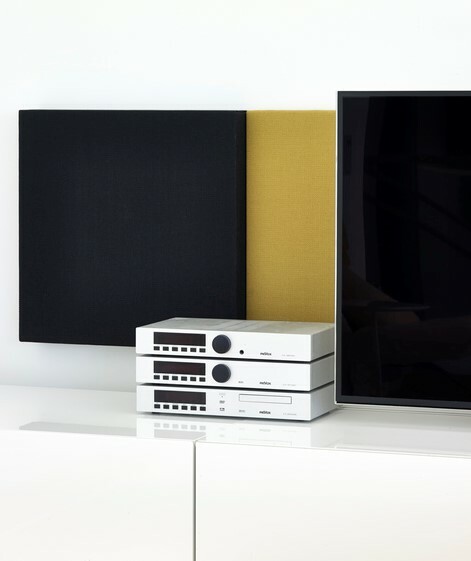 Both Loudwhisper speakers image as is usually the case with wall loudspeakers: sitting where one should, the sound sources can easily be located between the loudspeaker cabinets while the listener him- or herself is only partially inside the boundaries of the stereo image. These speakers are as if created for relaxed listening, but not so that music would flatten into mere background music. On the other hand, listening outside of the stereo triangle suits these loudspeakers especially well. They may be better so used than in traditional near-field listening. For example, with the larger Loudwhisper I preferred to hear them horizontally positioned precisely because the sound image was less accurate laterally and not as “dry” as when one sits on the hot spot. I can well imagine how these speakers are typically listened: in the light of a candle or under daylight, music coming not directly from the front but more from the side of the other ear, a newspaper or a glass of wine in one hand. You get the point. 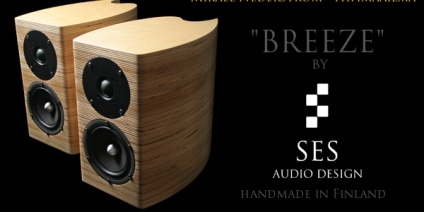 These speakers are as if created for relaxed listening, but not so that music would flatten into mere background music. Woodnotes’s take on loudspeakers, the Loudwhispers, offer a quality sound from elegant, interior-friendly inconspicuous cabinets. Quite simply. 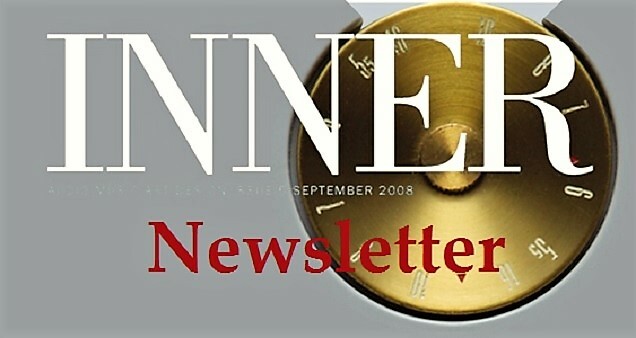 Prices: the smaller (60x60x10cm) Loudwhisper: 2491 euro per pair, the bigger (60x80x10cm) Loudwhisper: 2890 euro per pair.